As USP <800> requirements spurred necessary upgrades for the pharmacy in Gillette Children’s Specialty Healthcare campus, the renovation also offered the opportunity to go beyond basic technical requirements. Through proper space planning and ergonomic workplace design, the renovation transformed office space into a state-of-the-art pharmacy that puts staff comfort on par with safety. A carefully orchestrated intake sequence enables staff to safely receive, store, and handle potentially volatile drugs via a series of securely enclosed rooms. 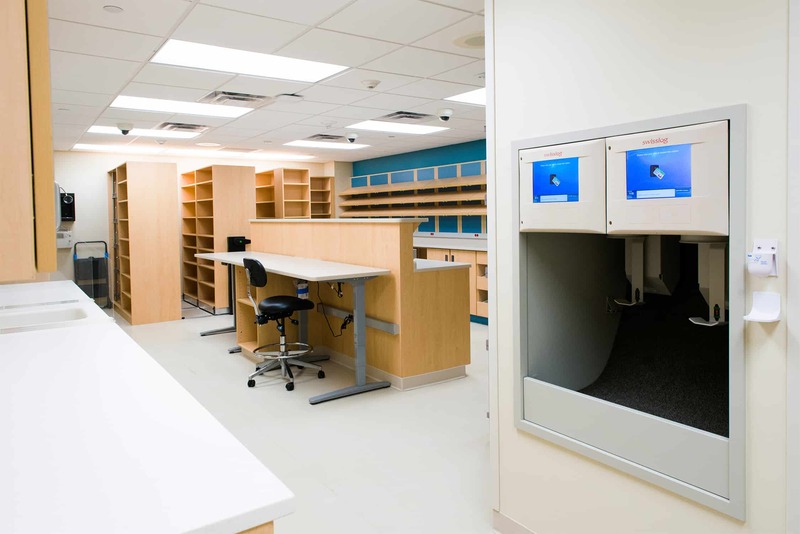 While Gillette’s former pharmacy had a sterile prep room, the renovation introduces a hazardous drug prep room and the ability to compound hazardous drugs “in-house” for the first time. Pass-through windows and intercom systems allow staff to perform their work and hand off drugs without de-gowning. The design also better prepares Gillette for any future changes to the National Institute for Occupational Safety and Health (NIOSH) list while improving the staff experience. Ergonomic design details improve the work environment for staff. From a 6-inch rise to the existing ceiling height to cushion-back flooring, the workspace is more user-friendly, open, and easier to clean. Workstation features include appropriate task chairs specified for cleanrooms, sit-to-stand workspaces, and abundant countertop spaces that are easy to maintain and provide ample area to handle multiple tasks without disruptions to the workflow.